Anxiety and depression are not real disabilities, according to Tory twit George Freeman. Some of you will already have worked out that Joe Halewood is saying the same thing I reported on This Site a few days ago. This is a good thing. It means he is spreading the message that the Conservative Government isn’t interested in helping people live with disability. The aim of the Personal Independence Payment is to appear to be helping people live with disability. In reality, there is only a certain amount of money available (and liable to shrink any time the Tories want), and the conditions under which people receive benefit will vary according to that amount. The fact that people with serious conditions, who live in pain every day, will lose the wherewithal to have any kind of meaningful life – and may choose to end it all, like Marie Lopez, is of no consequence to Tories. Human lives have always been worth less to them than money. The Tories have just admitted that the assessments for PIP are meaningless and nothing more than a charade. 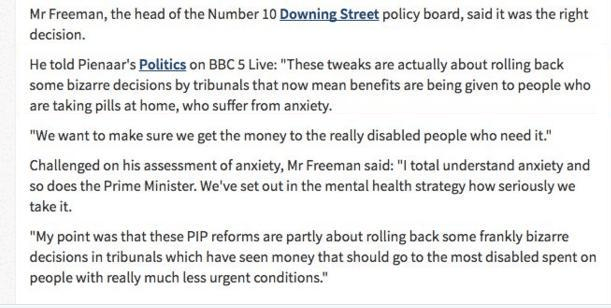 If PIP can only go “… to the most disabled”and as the government want to make sure they “… get the money to the really disabled” then it means that the total amount of PIP paid out must be cash limited! It means the government will NOT pay out more than a total sum and therefore means that the whole purpose of the claimed “assessments” for PIP are meaningless. The reality of the Tory position is we have £x of money we are prepared to spend and we will not spent a penny more regardless of your disability. More money wasted on window dressing fake news. Since CPFT took over community rehabilitation everything has been rushed into. There have been no proper staff consultation(called it consultation but none of the responses were heard to). The trust is very policy focused and less staff and patient friendly. Many well established staff were pushed to leave. There is no or very limited funding for even basic patient needs. Senior Management and HR are clueless with patient queries. Everything is chaos. Looks like our mental health colleagues are more well off(as they have been a MH service before taking therapy services over) . It is appalling that a NHS trust is gearing and using a more business like model. I do not enjoy my work anymore but I love my patients which keeps me going. I do not recommend this trust . Everything is a no apart from the fact that it is NHS so u get paid and the job security, of course. I say ban pip as I’m disabled and now struggle to make ends meet and I have a disabled daughter to look after I think DLA should be brought back it’s outrageous people have to go without , as I got turned down for pip it’s just not right . I would sure like to see the government suffer if they were in my shoes they wouldn’t know how to cope , it’s disgusting disabled people have rights too and shouldn’t make them suffer by turning them away from there pip . At the recent Davos conclave, Philip Hammond, the Chancellor, stated publicly that the primary duty of any government is to ensure that its people can maintain their living standard. In cutting benefits such as PIP and ESA, this government stands in dereliction of its duty as defined by Hammond. There needs to be a way for affected people to seek legal redress against this government. I think these cuts for the disabled people are unacceptable. You don’t hear the government cut there expenses or wages. The other thing is they pay teachers and learning support teachefs in the holidays for doing nothing. Also they give alcoholic’s and people doing drugs extra money a day that should be stopped to save money. As far as I’m concerned the government only think of themselves and not the people. This used to be called great Britain but nows it’s a joke I would recommend if it gets any worse people should move abroad. If it gets any worse my sister and I will go abroad.